On July 13th, we announced the Anniversary Release of War of the Ring Second Edition. We've received a lot of questions - directly and on public forums - and we could not answer all of them individually. Here's our best attempt to answer them all, so you can make an informed choice when pre-ordering opens, on July 20th, 2015. What's the date and time of the pre-order opening? Pre-orders are now open. Click here to visit the pre-order page. Pre-orders will remain open for 48 hours, until July 22nd at 6:00 PM UTC. A limit of one copy per customer's address will be enforced. Why is this a "limited edition"? Can't it be "unlimited" instead? Manufacturing a product like this one is a long and expensive process. Making the production "limited" is a real necessity - normal rules for stock management cannot be applied. We initially planned (and announced) a print run of 2,000 copies, and we consider this number to be a reasonable quantity to meet our customers' demand. But, a lot of our customers were concerned they could miss an opportunity to order the game by seconds. We hope 48 hours is an adequate time to make sure all interested War of the Ring fans, who cannot be in front of their computer at the time pre-order opens, will have a chance to get a copy. For this reason, we will not limit the prodution quantity to a pre-determined number. Instead of the initially announced 2000 copies, we will close pre-orders after 48 hours and manufacture the Anniversary Release of War of the Ring 2nd Edition based on that order quantity. July, 22nd Addendum: The minimum print run of 2000 copies is confirmed. Pre-orders will continue until stock lasts. Can you confirm the final price? What about shipping costs and custom charges? The price of the Anniversary Release is $369.00, due at the time of the order. Shipping charges will be requested along with your payment, as indicated below. 19% VAT (Value added tax,) must be added to shipments to residents in the Europan Union (VAT amount: $ 70.11, total price $ 439.11). Shipments will be sent out from one of two warehouses, in the USA and Germany. For this reason, residents in the USA or in the European Union will not incur in custom charges on their purchase. Custom charges may apply to residents of other countries according to local regulations. Shipments to destinations in the European Union are subject to a 19% VAT charge (German VAT rate), according to European law. What about the release date? Is "Spring 2016" realistic, or should we expect delays? We estimate the release date as "Spring 2016." In fact, we have already started, beginning in March, a production line to manufacture our planned 2,000 sets. Manufacturing of these painted sets will be completed in about 6-8 weeks. Remaining components will require 3 to 5 months to manufacture. So, we are optimistic the release date we set will be achieved, or even improved. Normal manufacturing delays, or shipping delays, are always possible, of course, as well as "force majeure" events. We factored a reasonable amount of this risk into the estimated release date. However, if the pre-ordered quantity exceeds 2000 copies, we may need to consider shipping the product out in waves - but only if absolutely necessary. In this case, copies will be shipped first-come, first-served, with the initial production of 2000 copies shipping first. Realistically, we should be able to fulfill all such orders in Spring or Summer 2016, at the latest. What are the contents and features of the Anniversary Release? 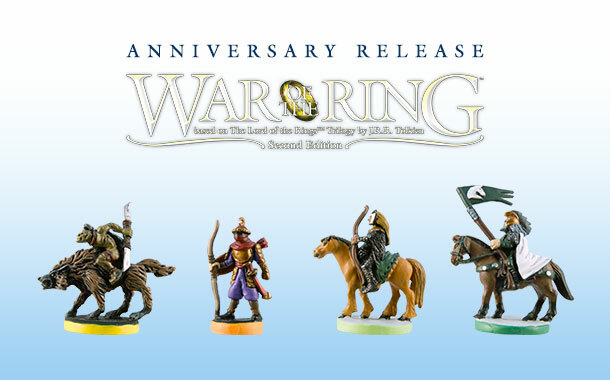 The main improvement of Anniversary Release over the normal version of War of the Ring Second Edition is that all figures are hand-painted to a very good quality standard. We will also include two beautiful hardcover volumes, in a slipcase, graced by full-color art by John Howe: the 2nd Edition Rulebook and the War of the Ring Companion, written by Kristofer Bengtsson. Action Dice (16 dice) and Combat Dice (two sets with 5 dice each) will be produced in new colors, unique to this version. On top of that, we will provide larger game boards (for a total playing area about 3' x 4') and improved reference sheets on special cardstock. Counters and cards will be the same as those included in War of the Ring 2nd Edition, to ensure full compatibility with the regular version of War of the Ring 2nd Edition and its expansions (Lords of Middle-earth regular and limited edition; the upcoming Warriors of Middle-earth). Rulebook and cards will be updated to reflect the most current FAQ and Errata at the time of printing. A numbered certificate of authenticity will be included with each copy. What about the expansions? Are any expansions included? This set does not include any expansion components. First, many of you like to play War of the Ring "as is" without expansions, and adding these components would make the Anniversary Release more costly. The other problem is that in no way we could produce, today, a "complete" set of base game + expansion, because our expansion plan for War of the Ring is to manufacture three expansions. 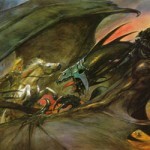 One of them, Lords of Middle-earth, is on the market, and it already had a limited release (in 1000 copies). In the coming months, we will publish the second expansion - Warriors of Middle-earth. We are considering offering a limited release of this set with painted figures. If there is continued demand, we will do the same for the third expansion, when it releases (no release date can be announced yet). When the "trilogy" of WOTR expansions is completed, we would like to manufacture one set including all three expansions, as a future "companion" to the Anniversary Edition. However, we cannot promise this will happen, nor offer a firm release date. Changes in manufacturing costs, for example, could make the release of these sets impossible. So, we recommend you do not base your purchase on the expectation of a future release of painted expansion sets. What about the box? Will it be wood, or cardboard? We plan to use a cardboard box, manufactured to a similar standard - in terms of production quality and artistic design - as the Limited Edition of Lords of Middle-earth. The box size will be about twice that of War of the Ring Second Edition (40 x 54 x 12 cm). I am only interested in some of the contents, can I purchase them separately? We are currently asking permission to the licensor, Middle-earth Enterprises, to offer some of the contents as individual items. Our license is limited to board games, and does not include other items. Pending approval, we hope that we'll be able to offer the slipcase with the two volumes, and possibly the game boards, for separate purchase. We will definitely not sell the painted miniatures separately from the rest. We don't expect a final answer on this topic for a few days, so please don't make your purchasing decision based on these considerations. Are you offering the Anniversary Release through stores and distributors? Given the limited nature of the production run, and the very expensive manufacturing costs, unfortunately, we cannot offer the Anniversary Release through the normal distribution network. Retailers and dealers are welcome to place an order within the allowed 48-hour pre-order window, but no discounts are given on these orders. Please contact our sales team for additional clarification on this topic. Are there any plans to publish Anniversary Release in languages other than English? We are currently discussing this possibility with our publishing partners, but at this moment, only the English edition is planned. If, at a later date, a translated edition should be offered by one or more of our partners, we will allow you to replace the English edition you order with the translated version of your choice, free of charge.